As countless Rdio fans sit back helplessly as their accounts go dark, it’s time to be blunt. Spotify continues to outpace its growing army of competitors, and if you’re going to spend money on a streaming music service, you should sign up for Spotify Premium. Or save a few bucks and get the free version, because it’s pretty damn great, too! This is not off-the-cuff advice. I’ve spent years cycling through streaming music services, trying to figure out which one could satisfy my embarrassing addiction to disco while still entertaining my even-more-embarrassing dedication to top 40 hits. I looked for something that worked as easily on my desktop as on my phone. I made playlists, obsessively, and yearned for the sort of serendipity I used to enjoy after hours of hunting on music blogs. You know what? Spotify finally got it right. It took a few years, but the Swedes strike the perfect balance between the three qualifications I just mentioned above: selection, user experience, and serendipity. Before you bust out that credit card and start spending, however, let’s talk about how that works. This isn’t that big of a deal, despite common sense suggesting otherwise. Nowadays, pretty much all of the major streaming services offer about 30 million songs, and they’re all pretty much the same. That means that you’re probably going be able to find whatever you’re looking for, and then some. There are a couple of exceptions to this general rule. If you want to listen to Taylor Swift, for instance, you’ll have to look on Apple Music, since it’s one of the few services with streaming rights to her music. For Prince, you have to go to Tidal. For the Beatles, it’s even worse: You have to buy the albums. With that in mind, if you’re a big fan of that rare artist who isn’t on Spotify, you can still buy their albums and listen to them using Spotify’s “Local Files” feature. Overall, it’d be more worthwhile than signing up for a different streaming service simply because that particular artist streams music there—because Spotify’s user experience is the best. I used to be an iTunes fanatic. However, over the years, the simplicity that made the app great went away. We’re left with a dumb gateway to the iTunes Store and the painfully confusing creation that is Apple Music. Spotify’s elegant design reminds me of the old, good iTunes experience, with about two dozen bonus features. Browsing through artists and albums is effortless, whether they’re stored on your hard drive or Spotify’s servers. And I love Spotify’s constantly evolving playlists and suggestions. I even use the social features that I always thought were sort of dumb, because sometimes it’s fun to send your friend a song. Other streaming music services have social features, too, but they feel clunky and counterintuitive. What other streaming services don’t have is the uncannily awesome Discover Weekly playlist. This deeply personalized feature updates every week, and it’s become my favorite thing about Mondays. On my phone, I keep this playlist saved for offline listening—another feature most streaming apps have—but since Spotify is always updating it, the playlist always starts fresh once a week. The satisfaction I get from finding great new artists is hard to express. I would never describe myself as a music snob. I’m an enthusiast, equally happy listening to banjo-plucking bluegrass or weird minimal techno. Since all of the streaming services have similar libraries, streaming services distinguish themselves with how they help users dig into the virtual album crates to find the real unexpected treats. This song-searching seems sometimes automatic on Spotify. The Discover Playlist is where I find most of my new music. I also create radio stations from songs or old playlists. 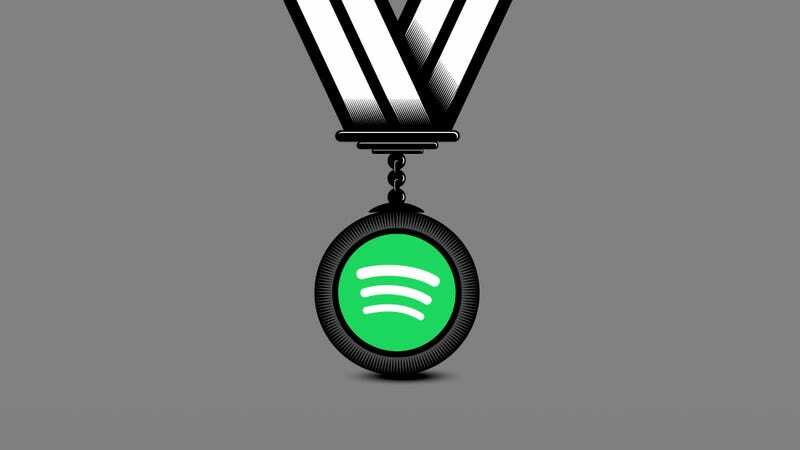 I explore Spotify’s native playlists more than I thought I would. The real hidden gem—and what makes Spotify special—is the wealth of user-generated playlists. Here’s an example: When I first signed up for Spotify, I had this obsession with the Drive Soundtrack. The wispy magic of Cliff Martinez’s hipster opera wasn’t on Spotify yet. (It is now.) When I searched for it, I found tribute playlists assembled by Spotify users around the world, filled with music I’d never head before. While other streaming music services have public playlist features, none of them have the Spotify community. Do the free trial. Heck, do the Apple Music free trial at the same time. I’ll bet you a buffalo nickel that Spotify will be more fun. I’d be a bad tech blogger if I didn’t point out how some other services make sense for certain users. If you’re a penny-pinching Amazon Prime user, go ahead and enjoy the streaming music service included in your membership. If you’re a Google fanatic, you might find some benefit in staying in the search giant’s walled garden and using Google Music or YouTube’s pointless music offering. Do what you want. If you simply want to keep listening to your favorite songs and find new ones, go with Spotify. It’s long been the leading streaming music service, and it’s doing an impressive job of continuing to beat the competition. Spotify is the best. Full stop.